Amazon's just come up with a response to the Instant Preview feature that Kobo launched last week, only Amazon figured out how to do it right. 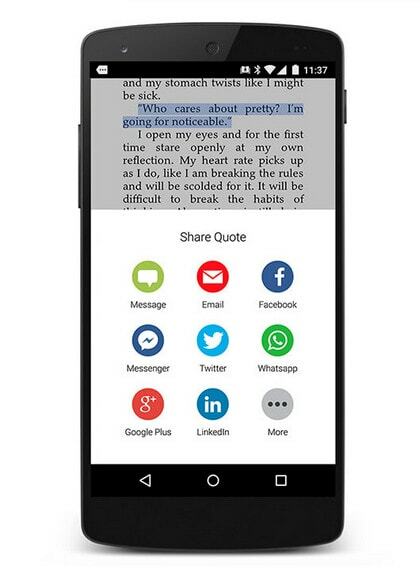 Where Kobo came up with a way to attract readers by letting them read excerpt in Kobo's iOS apps, Amazon is enabling Kindle readers to share quotes with non-users and let those non-users also read an excerpt with no app or hardware required. Amazon announced the new sharing option today in a press release as part of a total revamp of the sharing experience on the Kindle platform. Kindle readers have long been able to share snippets from the books they're reading on social networks, and anyone who didn't have a Kindle account has long been able to read those quotes (they can be seen on kindle.amazon.com). But as of today, when a Kindle reader shares a snippet they can choose to share it with specific friends, groups, and more, and the friends who receive the shared quote can read it and instantly start reading a free book preview right from their phone, tablet, or PC - no need to sign up, sign in, or install an app. The recipient will probably need a web browser to read the excerpt; the only way I can see for Amazon to make this work is to use the Kindle Cloud Reader to display the excerpt. The new feature is launching on the Kindle for Android app today, and it's coming to Kindle ereaders and other devices later this year. You can find more information about the new sharing features and test samples on this page at Amazon. This is a nifty feature, and while I'm sure it will be useful for sharing I also think Amazon has an ulterior motive. Amazon sees this as a marketing tool first, and a sharing tool second. Amazon added it because it would help recruit new readers, although I'm sure that it didn't hurt that this would be a fun option for current readers as well.